When people hear Technology Department they usually think about the tools. The hardware. The stuff. Sure, there is plenty of that in our world, but what we are really after is helping people develop the skillset to use these tools as a springboard that transforms education and opens up mindsets of innovation, advocacy and problem-solving. We exist at this amazing intersection where Toolsets, powered by Skillsets, transform Mindsets. Here staff empower students to exercise autonomy and confidence in learning every day. Toolset, Skillset, and Mindset recently came together in an inspiring way here in White Bear via our crowd-sourced innovation program, The Big Sleuth. When our incredible staff was challenged to come up with ways to improve our school district, they submitted nearly 150 ideas and then voted on the ones that had the biggest impact. Big Sleuth idea champions are now collaborating with teams of staff and students to design-think their problems. This work will span the next few months and will take them through empathy, definition, ideation, prototyping, and testing. Teams are digging into ideas around mental health supports, school start times and student washing machines as well as recess time, access to school pictures, and flexible professional development. This type of advocacy and shared problem solving is EXACTLY the kind of skill we want to model for, and encourage in, our students. How do we get there? To effectively integrate technology, we need a robust Toolset, a strong Skillset, and the Mindset to champion ideas that empower autonomy and confidence in learning. Toolset is the stuff we see and use, like Chromebooks, PC’s, and wireless access points, but it is also the understanding of how to employ those tools to strengthen teaching and learning. When we take advantage of the efficiency built into Google tools, for example, we automate low-level tasks and create more time in the school day for collaboration and higher level thinking. 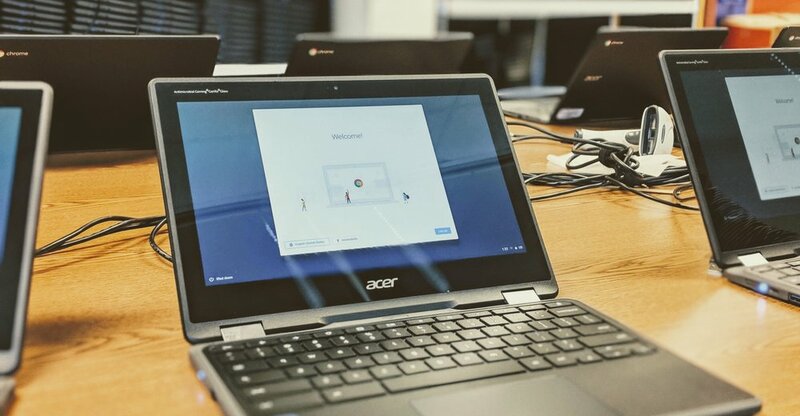 As a technology department, we provide access to, and daily support of, all hardware, including our 1:1 Chromebooks in grades 3–12 and 2:1 Chromebooks in K-2. Our technicians maintain devices and manage the software and networks that power our core work. We collaborate with teachers and instructional leaders and we offer varied staff development and support such as Google level I and II certification, one on one coaching and summer innovation camps. Students and teachers have access to a growing toolset to make the learning choices that are the best fit at any given moment. Skillset is putting that toolset to work to engage in deeper learning. This development can be measured by the 4C’s. To better communicate, collaborate, think critically and express their creativity, learners need a robust skillset that leverages technology. A 4C’s checklist is the perfect lesson plan header. In a discussion about the current state of education, I once heard an educator exclaim, “We used to focus on integrating the 4C’s into the curriculum, now I understand that the 4C’s should be the curriculum.” I’ve seen the power of that philosophy on display in classrooms across our district. I’ll never forget walking into a 3rd-grade classroom here in White Bear and overhearing one student say to another, “You don’t get it. This is not all about you. We’re supposed to be collaborating now.” Their teacher could not have been prouder. That was the 4C’s in action! That 3rd grader’s agency and the understanding that one must take risks while learning was palpable in that classroom. The 4C’s skillset there grew because students were supported as they stepped out of their comfort zone. They saw their teacher model and support this ethic daily. As educators, we are mirrors. When we model these skillsets for our students, they mirror them back. Technology departments and instructional leaders support staff and students as they use technology to better communicate, collaborate, think critically and express their creativity, because authentic work centered around the 4C’s is one clear way to foster accountability and growth. To that end, we provide coaching, encouragement, and updates on the latest tools for differentiation and content creation. Students hone their own skillsets through the practiced construction of their own learning. I saw this in a 1st grade classroom where students were writing and sharing autobiographical, non-fiction stories. I heard it from a 6th grader who testified for water conservation at the state capital, and I’ve witnessed these skillsets come together in a group of students who collaborated to send science experiments into the stratosphere along with a plastic model of our school mascot. Those students were applying technology and 4C’s skillsets to extend authentic learning experiences. Once this becomes innate in a classroom, the mindset shift to increased student agency can happen almost organically. Fortune 500 companies (and school districts!) are looking for employees who can communicate, collaborate, think critically and express their creativity. They also want workers to can solve complex problems while understanding, managing and negotiating with and serving others. We help students develop these skillsets and mindsets when we model them in learning environments that prioritize autonomy and build confidence. To emphasize the importance of the point, the first strategy in our District’s strategic plan declares we will ensure that each student is the primary agent in their learning. Technology provides a platform to access expertise and an authentic audience to showcase the work students produce. This validation gives their expanded autonomy and confidence greater meaning. A teacher at White Bear’s North Campus explained it to me this way, “When our comfort is high, our growth is low. We need to step out of our comfort zone in order to experience real growth.” That is true for all of us. Brave New Workshop talks about a mindset of discovery. Their five ideas provide a clear pathway to an innovator’s mindset. They call for us to listen rather than checking out. To defer judgment rather than criticize. To reframe rather than whine. To declare our thoughts rather than concealing them. And to jump in rather than stall. By leaning into these five traits we elevate and mirror the innovator’s mindset for our students. White Bear’s technology department hires student interns in the summer. We run clubs, engage students in creative problem solving and offer technology courses. We’ve employed students in device repair and we’ve deployed Makeries across the district to encourage creative problem-solving. We are looking at how classroom spaces and technology impacts learning with the goal of being able to customize learning spaces to better meet student needs. And because technology changes rapidly, educators step to the edge of their comfort zones every day as they model learning, in real time, in front of their students. Like many districts, we’ve made important investments in technology. We owe it to our students, our community and to each other, to implement our investment in the most impactful ways possible. The Toolset, Skillset, Mindset framework gives us a tangible way to reflect on where we are as educators and students. To step out of our comfort zone. To model learning as we employ new technologies. To take risks and ask for the help we need. To champion big ideas. And, most importantly, to continue to ask, how might we promote even greater student confidence and autonomy across our entire district? Go Bears! Like and share using #innovate624!